Enthusiasm can be a double edged sword, if I may use a cliché. And I know that better than most. Having decided that you want to get some chickens – and that has been a well thought out idea, weighing up not only the delights and benefits, but the ongoing commitment and work – then the first area you must place your enthusiasm is in the housing. This may appear a rather boring expression of that enthusiasm you feel, but without predator proof and appropriate accommodation, your enthusiasm and, more worryingly, the girls themselves, may all disappear down the throat of a fox or some other local animal in the space of several minutes. If not a predator, then in our typical Summer conditions, the chickens can die of heat exhaustion as they crowd into the pen seeking shade. Either of these scenarios is a most distressing sight and, in most cases, can and must be avoided. On our farm, housing has been given a lot of thought and has been built with several important ideas incorporated. That said, in reality the hens and roosters don’t spend all that much time there. Perfect; they are out grazing, foraging, dust bathing and just generally chatting with friends, rather than being cooped up and confined to a set piece of ground. A “set piece of ground” to us implies barrenness, parasite conditions, boredom, poor health and poorer quality eggs. Just as dark settles on the farm, one of us goes out to lock up. We leave it until this late – we have been forced to leave it until this late –because by then we are assured that the last stop out has gone to bed. They love being out all day and almost appear a little reluctant to have to stop the delights of the day. I guess that when life is stress free, safe, communal and all your basic needs are met, then why would you want one day to end! Couldn’t we humans learn a lot here! In line with t he permaculture zones concept, chickens should be close to the house. Firstly, so they can be enjoyed visually (and on a one to one basis). Secondly, they need to be accessed several times each day: let out, fed, watered, eggs collected and locked up. Thirdly, any issues can be heard or sighted if they are nearby. We have used a number of different feed containers in the past and found them unsuccessful. The big bin which is filled irregularly and fed out from a shallow rim at the base was found to be wasteful. Rather than clean up the lot, the girls pick the best and flick out the rest. It also precludes from easily changing the feed routine. We now have some large rubber tyres cut in half. They are easily cleaned and the amount of feed regulated daily so the girls clean up completely. Water needs to be cool. Automatic drinkers are fine as long as the source of water and the lines are shaded. We use fairly large plastic containers which carry about 10 litres of water. There is a tap and hose near the pen for washing and refreshing these. During baby chick time a couple of bricks in and out of the containers provide a safe entry and exit for little ones. Protection from the Southerly and Westerly wind is by having the house with blank walls to those directions. North or East facing is good. This is dependent on the number of birds and whether or not the girls are let out each day. Ours have a predator free Orchard in which to roam and do not need a massive yard size but large enough to potter about in the early hours before we release them. From a maintenance point, it is best to have a house in which you fit comfortably. Getting inside the house daily to collect eggs is a good way to inspect conditions and make prompt decisions about cleaning and maintenance. So a height of 2.1 metres and width and depth adequate to take all the nesting boxes and perches with space for you to access the boxes is good. Each bird needs room to perch. In hot times they need more space, when cool they will snuggle together. Allow about 300 mm per chicken on average. We use a tiered structure and keep the perches up high so that cleaning underneath is easy; birds like to be up high too. The roof of the house extends forward about 1.5 metres outside the house providing shelter from the rain for feeders and chickens. It also serves as another way of stopping the sun beating directly on the front of the house. Some deciduous shade trees have been planted to help cool the house and yard during Summer, particularly on the western side. A misting type watering outlet is located on the roof and can be activated on the worst Summer days to ensure coolness. Also a strong trellis has been constructed to wrap around the actual house. It has been built about a metre out form the exterior of the house and a Passionfruit vine planted to climb up and around the trellis to provide further shade protection and fruit for us. You could use a grape vine or any hardy, rampant grower, preferably one that produces some food for you and/or the chooks. Our pen is divided into two units with a joining door. Sometimes when we want to isolate some birds ,we shut the internal door. This is handy when introducing new chickens. The entire front of each half is a door which can be opened to allow a trailer or small tractor to enter. Although the floor is a dirt base with sawdust infill, the entire structure sits on a concrete foundation raised about 300 mm off the ground. This keeps the sawdust in and the digging predators out. We raised the entire steel pipe framework off the ground which reduces corrosion possibilities; chicken manure is very corrosive. 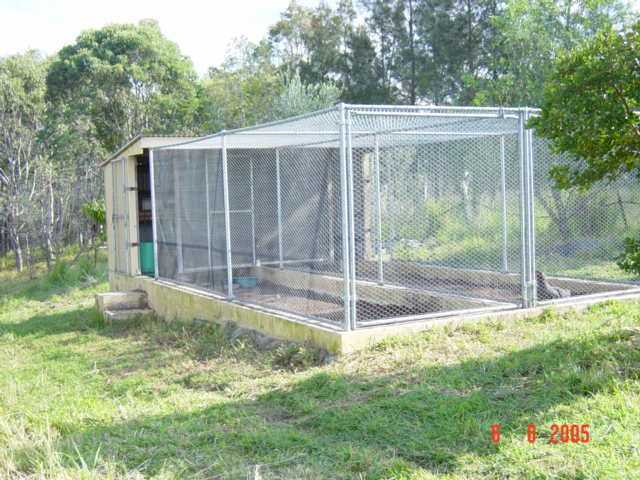 Full galvanised steel pipe forms the frame for the heavy duty chicken wire (the chicken wire is also used to enclose the top of the pen and yard too in order to stop bird flying in and taking eggs. This butts up against the wood frame house which is clad in coated galvanised corrugated steel sheeting. Care has been taken to reduce gaps to a size which prevents goannas from entering. The access doors, suitable to admit a 2m tall person without stooping, are steel pipe frames with chicken wire infill. The latches are accessible from inside and outside the pen. The house area is three sided with a flat roof ; the fourth side is covered in shade cloth for better ventilation. This is the side facing the north easterly direction.